While many squadrons’ cruise videos are exciting, a lot of the footage is dramatized to boost the videos’ appeal. Knowing I have a GoPro on me, I may add an extra fist pump going down the catapult to boost the cool-factor on camera. In reality, the hand signals for all of the launches and recoveries are nearly identical. If a pilot invents a move on the fly, it may be misunderstood to be something else leading to a potentially devastating outcome. This is not to say that Naval Aviators don’t have a “pregame” ritual, just like superstitious Major League Baseball players, but it is usually not in the form of something that could confuse the crew on the Flight Deck. What I can do to better answer this question is to go through all of the procedures and hand signals for launching and recovering aircraft to help illuminate what exactly happens in these sweet videos. After startup, when the pilot indicates he is ready to go flying, he will pass the thumbs-up to the Plane Captain. The Plane Captain and pilot will then standby until a Yellow Shirt arrives to take over control of the aircraft. 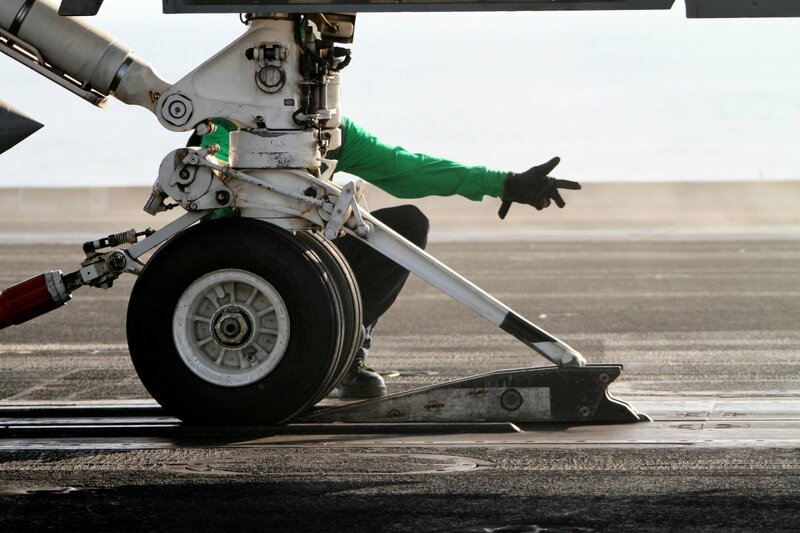 An aircraft on the flight deck never moves unless under a Yellow Shirt’s control. Whether it is taxiing or being towed, these “directors” will always be there to control the aircraft’s movements. As a general rule, all signals passed to pilots will be passed above the waist and all signals to others on the flight deck will be below the waist. The Yellow Shirt will first confirm the thumbs up to go flying, and then pass the signal to “break down” the aircraft. Sweeping motions of the arms indicate that the chocks and chains will be removed and that the aircraft will be held in position with only the brakes. After the plane is broken down, taxi signals are used to direct the aircraft around the flight deck. These signals are universal in aviation: waving arms to taxi, one arm bent to indicate a turn. All of the aircraft turns will be made at idle power, to avoid sweeping high amounts of thrust and sending people overboard. Yellow Shirts are not allowed to move while taxiing an aircraft. This is to prevent the illusion that an aircraft is moving when it is not (especially crucial at night!). When the aircraft reaches the Yellow Shirt that is controlling him, he will be “passed” to the next one that is waiting for him with a point in the direction of the next director. The aircraft is taxied to one of the four catapults and the route, direction, and sequence of airplanes is all prearranged and controlled by the “Handler” in Flight Deck Control. They even have contingency locations for aircraft that go down and can’t make the launch. Once at the catapult, the aircraft will be given the signal to spread the wings: a sweeping motion of the arms from the chest to the fully outward extended position. The director will then signal to lower the launch bar by outstretching an arm forward (which kind of looks like he is flipping off the pilot). The aircraft will now taxi very slowly and precisely to align the launch bar with the catapult shuttle. Just prior to settling into position on the cat, an aircraft loaded with ordnance will need to be armed. An “Ordie” or Red Shirt, will pass the hands-up signal to ensure that during this dangerous evolution that both pilots arms are visible. Many pilots like to put their hands in a “cocked gun” shape (found in many cruise videos), but that is not required. The Ordie will then pass the arm-up signal by extending both arms forward and putting one fist underneath a palm. Once armed-up, the aircraft can taxi fully into the catapult and take tension. It takes A LOT of power to taxi these few feet to overcome the force of the holdback fitting on the back of the nose gear. The next signal is one of the most frequently seen in cruise videos: the “take tension” signal. The yellow shirt will look both ways before doing two hand signals at once. One hand will be raised with a palm open to indicate “off the brakes” and the other hand will be outstretched straight forward to indicate take tension. The jet then squats into position and is now at the end of a loaded gun. That last director will then “pass” control to the Shooter who will wave his hand in the air furiously for the “run-up” signal. The pilot will set military power, raise the launch bar (it won’t actually rise until after launch), wipe out the controls, and do a final check of the instruments. If the weight-chit submitted to flight deck control prior to startup requested a “combat” shot, the shooter will then pass the “select afterburner” signal that looks a lot like raising the roof. Satisfied, the pilot will salute the shooter and then place his hand on the “towel rack” on the canopy bow, or on the stick, which is just a matter of personal technique. The shooter will return the salute, point to the each of his final check items and then touch the deck and point forward, signaling the launch. In the above video you can see these signals from the perspective of a T-45C Goshawk pilot. However, you may notice one procedure is outdated: in this video the pilot runs up the engine immediately after taking tension. Today, the pilot waits for the run-up signal from the shooter. After landing, the signals are much simpler. Looking to his right from the landing area, the pilot will see a Yellow Shirt pulling one of his thumbs backwards, indicating to throttle back after the trap. A moment later, the hook up signal is passed by moving one thumb up into an open palm. The pilot will then pass a thumbs up or down to the Flight Deck Chief indicating that the jet is either up or down for maintenance. From there, the aircraft will taxi until the yellow shirt passes the same signal as before to install chocks and chains, before handing the jet over to the Plane Captain. This was a great question from one of our fans. I hope the answer makes the Flight Deck seem a little bit more controlled and a little bit less chaotic.